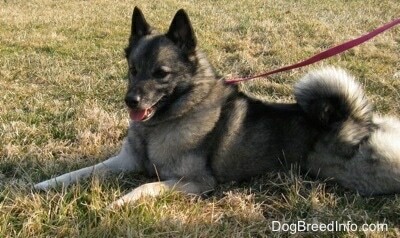 The Norwegian Elkhound is alert, bold, loyal and friendly. Although some may be somewhat reserved with strangers, it will greet family and friends it knows with enthusiasm. Docile, trustworthy and energetic, they are good child companions. 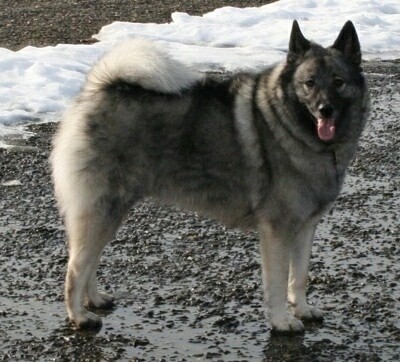 Like other Arctic dogs, the Norwegian Elkhound has a mind of its own and is fairly independent, however it is affectionate with its family. They have an outstanding character, and are relatively clean compared to some other breeds. Can be somewhat difficult to obedience train. It is important to be firm with this dog, showing good pack leadership. They need firm, but gentle discipline. A natural watch and guard dog. This breed likes to roam and bark. They were bred to be hunters who hold their prey at bay, barking at it constantly until the hunter arrives. If their barking becomes obsessive they must be taught enough is enough after they alert you once, it's time to quiet down. Be fair when training this breed, and understand it is a canine, not a human and treat the dog accordingly. If they are not 100% sure of their follower place in the world they can develop a tendency to fight with other dogs. 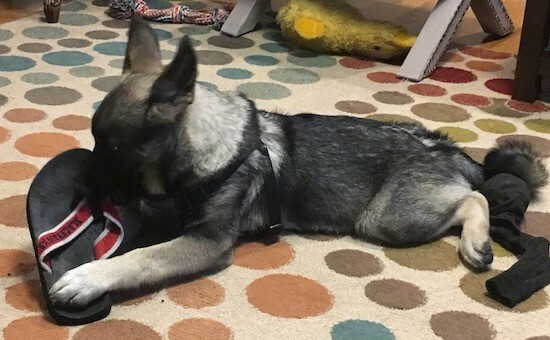 Elkhounds are hunters and should not be trusted alone with small non-canine pets such as hamsters, pet rats, mice or guinea pigs, however some have been known to get along with them when the owners worked at communicating to the dog that the small pet was alpha over them. They can get along with cats of the family. Without enough mental and/or physical exercise they can become high strung. Be sure to make the dog heel when on a walk beside or behind you, never in front, to reinforce the human is alpha over the dog; pack leader goes first. 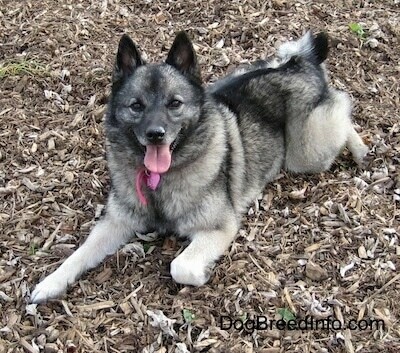 The Norwegian Elkhound is a very energetic dog that thrives on strenuous activity. They need to be taken on a daily, long, brisk walk or jog. While out on the walk the dog must be made to heel beside or behind the person holding the lead, as in a dog's mind the leader leads the way, and that leader needs to be the human. It should have at least an hour of exercise a day. It will enjoy a running beside your bike or a really good run in the woods, but remember that these dogs like to roam. If they pick up an interesting scent, they may ignore you, or not even hear you when you call them. The Norwegian Elkhound originated in Scandinavia and is one of the most ancient breeds; it is thousands of years old and has been around since the Stone Age. 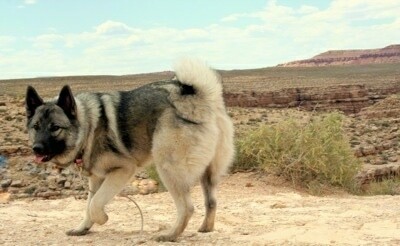 A skeleton similar to today's Norwegian Elkhound dating from 4000 to 5000 BC has been found. To put some perspective on it, these dogs have been around since man hunted with slingshots and lived in caves. They worked as a hunting and guard dog for the Vikings. The dogs were used as big and small game hunters tracking animals such as moose, elk, bear, mountain lion, badger, lynx, wolf, reindeer and rabbit. The dogs would track the quarry and alert the hunter by barking, holding the animal at bay until the hunter arrived. Norwegian Elkhounds can smell game from over a mile away. The dogs tended to work better at night than in the daytime. The breed is also highly prized as a sled dog. In case of war, the Norwegian Defense Minister has the power to mobilize all privately owned Elkhounds. In more recent times, the friendly and reliable character of the Elkhound has helped win a place in many homes as a cherished family pet. 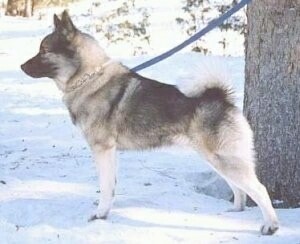 The name "Elkhound" is a direct translation from its original Norwegian name "Elghund," meaning "moose dog." In Norwegian, "elg" means "moose" and "hund" means "dog." The breed was first exhibited in 1877 when the Norwegian Hunters Association began holding shows. The AKC first recognized the breed in 1913. In 1923, the Elkhound Club was formed and the breed was officially recognized by the British Kennel Club. 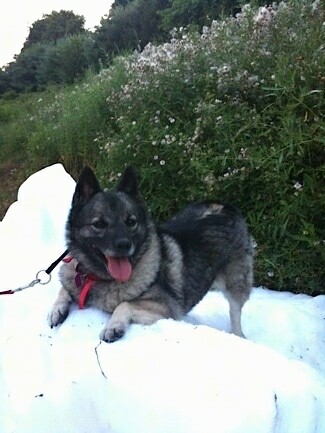 Some of the Elkhound's talents include: hunting, tracking, herding, watchdog, guarding, sledding and agility. There is also a Black Norwegian Elkhound that is recognized as a separate breed, but is almost identical in type except for color. "Tia the Norwegian Elkhound was out on a walk with Bruno the Boxer. It was an 80-degree night and Tia was hot. We walked behind an ice skating rink and Tia spotted something that looked like heaven to her! A mound of snow scraped from the rink! Tia rubbed her nose all over it, rolling in the coolness. To her the snow on a hot day was better than horse poop!" 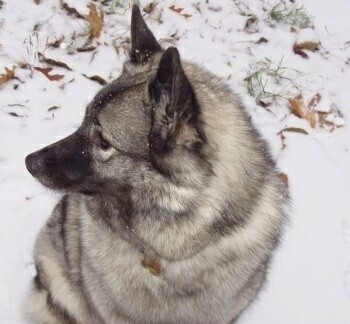 "Sophie, shown here as an adult, is a great Norwegian Elkhound. She has turned out to be an excellent companion and an all-around well-behaved dog. She loves climbing rocks and playing in the snow. Sophie lives in Canada and loves the cold winters. She will sleep comfortably outside in the snow at -30 degrees C (-22 Fahrenheit)." 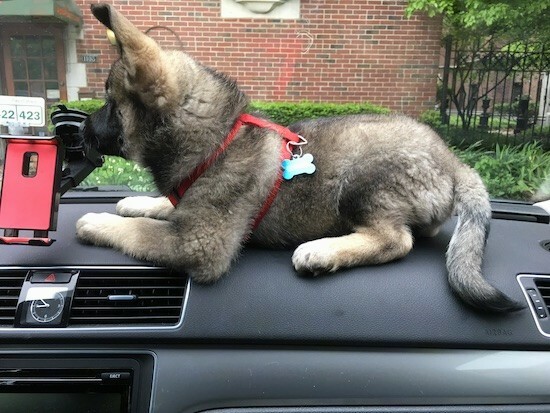 "This is Apollo, our 2-year-old purebred Norwegian Elkhound. Apollo comes from a champion bloodline. He is a loyal, affectionate dog, and thoroughly enjoys his non-canine family members (cats and ferrets). He has many of the typical traits of his breed, including being a fierce squirrel hunter and incessant barker when an unknown animal or human is on his territory. He is a fantastic watchdog, yet would never cause harm to anyone. He loves the snow, and runs around like a puppy dragging his open mouth in the snow during storms. 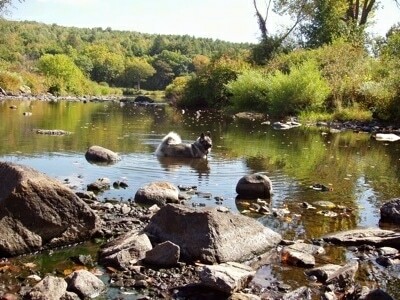 He also loves to play in lakes and streams during the warmer months. He resides with us in central Massachusetts." "Tia the Norwegian Elkhound out on a walk wearing her new Illusion collar. While the collar is not a magic tool, it sure did help. When Tia wears her normal collar and she reacts to something she sees, for example another dog, or tries to suddenly pull off to the side, correcting her took a lot of effort. So much so that my shoulder would hurt by the end of the walk and Tia would often make choking sounds from suddenly trying to pull when she spotted something. She is a hunting dog after all, however there is nothing safe for her to hunt when you are walking down the sidewalks of a busy little town. I noticed a difference in the collar right away. Now when Tia starts to react to another barking dog it only takes a small little tug to correct her and she keeps on walking, ignoring the other dog much quicker. 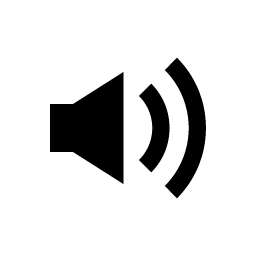 She's not trying to pull so persistently like she would, because when she does just a very short quick tug sends the message and reminds her to heel. I still need to correct her but it's so much easier on her and me, she responds so much quicker. With the Illusion collar Tia concentrates on walking rather than pulling excitedly and this gives her mind a chance to calm down and relax. Walks are so much more enjoyable for both of us! She's no longer choking herself. Tia's temperament has improved 100 fold from the day we adopted her from the pound. She's calm in the house and listens so well. We just love this dog." 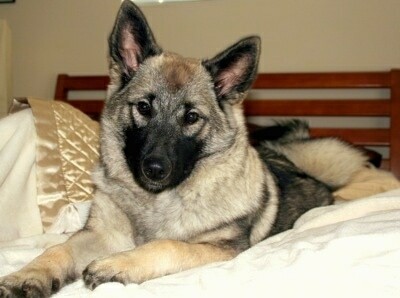 This beautiful Norwegian Elkhound is named Gustav. 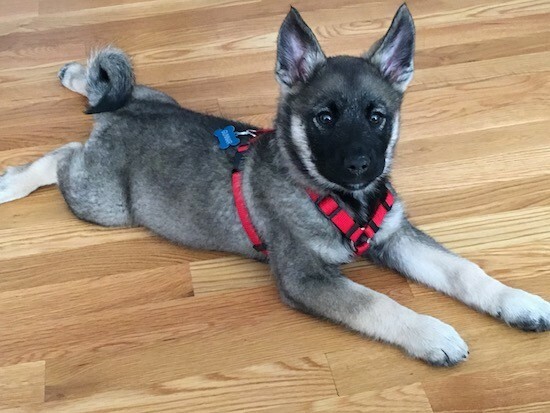 Gunnar the Norwegian Elkhound as a puppy at 3 months old—"Gunnar the Norwegian Elkhound is a super smart and energetic puppy, will do anything for a treat. We like to say that Gunnar is ALWAYS hungry and loves being with his humans! The only thing Gunnar loves more than chasing squirrels is sleeping on a pile with his humans. We are very happy to have this little fur ball join our family!"